We are 3E Concept Pte Ltd, a company offering interior design and renovations services. We are located at Oxley Biz hub at Ubi, and have an annual revenue of approximately one million dollars. We have been using Kingdee KIS Business V2.1(which we found on the Accounting Software Register of IRAS website) for about a year ago, and find that this software is much more efficient in generating financial reports, as compared to us adopting the manual accounting method. This accounting software complies with Singapore’s tax obligations and fulfil IRAS technique requirements, which is the basic thing that we were looking for in our choice of software. Errors are also largely minimized due to the highly accurate nature of the software. This software is extremely user friendly because after data is input, reports are generated quickly just with the click of a button. The layout is very pleasing to the eye as well. 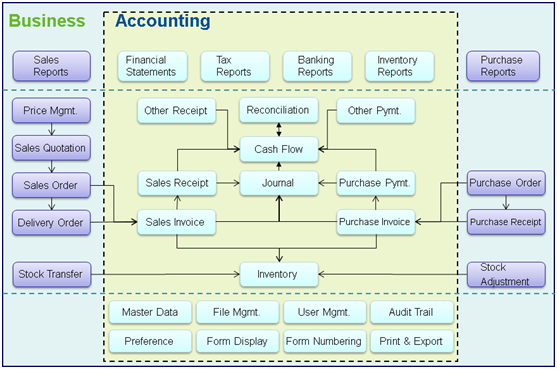 The best thing is that anyone can learn how to use this software and not just people trained in accounting. The features that we found were very useful were that transactions were easily traceable, as compared to paper trails where it requires time and effort to dig up past transactions. Multiple documents can be combined into one document if the customer happens to have multiple delivery orders. One sales invoice can be generated quickly for them, which increases convenience for our customers as well. Multi-currency transactions are not a hassle anymore as well, as the KIS software automatically calculates exchange rate differences in accounts payable and accounts receivable. To add on, printing of invoices can also be customized to our client’s liking, which helps us cater to our clients’ and our needs even further. Kingdee KIS Business V2.1 has improved many business processes in our company. For example, it reduces the time taken to generate financial reports manually. Keeping our accounts manually takes more effort and physical space to keep track of paper documents, to find information and to keep details secured. We are more productive and can use the time saved on generating these reports elsewhere. Less people are required to do overtime because this software generates reports instantly after data is input by the users as well, which reduces the stress of the workers in the company. We used to have a problem keeping our documents in proper order, as well as not having sufficient time to record our accounts in order since our volume of transactions is increasing day after day. Having everything on the computer helps us locate our documents easily even though we have many transactions a day. This also helps us keep our office tidier without so many paper trails lying around. Not only did Reach Technologies give us a reliable and professional accounting system, they also shared with us their experiences about the compliance of GST reporting to the government. As we are a relatively new start-up company, we are not experienced in the submission of the relevant documents to governing bodies. Therefore, we were pleasantly surprised to receive guidance and information from Reach Tech even though it was knowledge outside the accounting system. The service they provide is above and beyond their scope of service, which is fantastic! The consultants are patient when they provide training to us and are knowledgeable about the accounting processes that we are supposed to follow. They were able to answer the many queries that we had. We will definitely introduce this easy-to-use and certified accounting software to companies who are looking for a new accounting system!